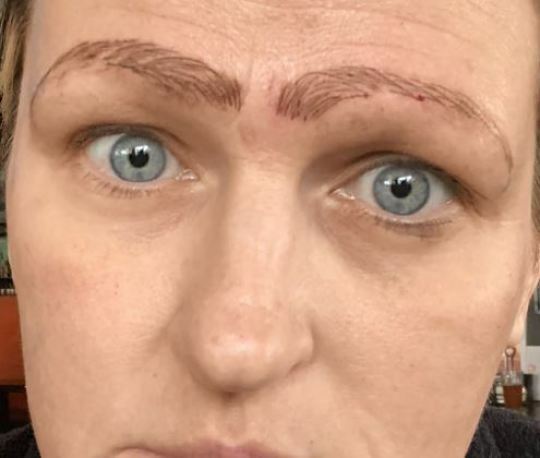 A woman was dumped after two botched microblading treatments left her with four eyebrows and no self-confidence. 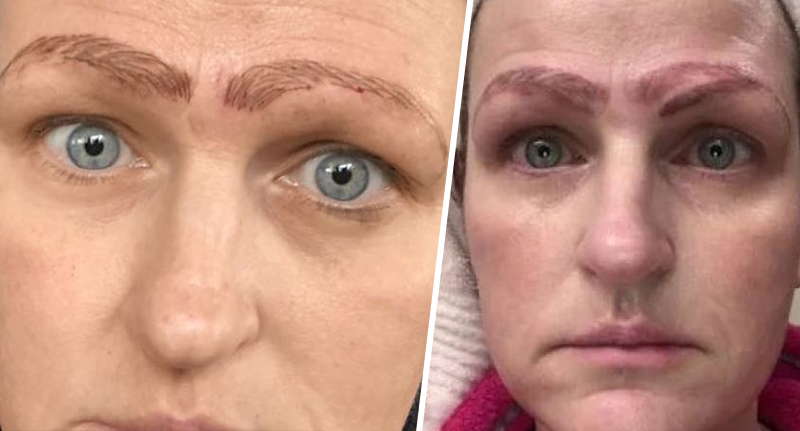 Jami Ledbetter was born with no eyebrows, so when her three daughters dropped $250 on a microblading voucher from Groupon, she was delighted to enlist a professional to help frame her face with a nice new pair. But the unqualified service provider gave Jami more than just metaphorical raised eyebrows. They have since gone out of business. In case you missed it, microblading is a tattooing technique in which a small handheld tool made of several tiny needles is used to add semi-permanent pigment to the skin. But when the first treatment went wrong, Jami went to another practitioner who said she could cover the first set of unslightly brows. Turns out, she couldn’t, and Jami ended up with another set of eyebrows which, to be fair, did rather distract from the first pair. Now left with two sets of brows, however, Jami was ‘devastated’. I would never wish this on my worst enemy. What it’s done to my self-confidence, it’s been hard. I was devastated. I was even dating a guy, and he stopped dating me at that point. Luckily licensed tattoo artist Kara Gutierrez is now using a lightening solution on Jami’s eyebrows which will help to pull out the colour and fix the hair-raising situation. Gutierrez warns this will happen to more and more people if the practice continues to go unregulated because it is classed as semi-permanent. Permanent makeup technicians in Kansas are required to train for 1,200 hours and complete at least 50 verified procedures and an apprenticeship, according to the Kansas Board of Cosmetology. Missouri state Representative Nate Tate is sponsoring House Bill 71, which would change the definition of a tattoo to include new cosmetic procedures like microblading, at the request of one of his constituents. I wanted to see what we could do to try to make the industry safer because it is becoming a very popular industry here lately. I’m not terribly in favor of more regulation when it comes to businesses, but in this particular situation whenever you’re actually punctuating the skin, we need to have some more training. People who want to make money microblading currently only need a certificate, which can be obtained in a matter of days in Kansas. In short, do your research.